CultJam Productions Blog: Satan’s Spiritual Structure: The Story of the “Doorways to Demonic Possession” and "Satan's Spiritual Structure"
Satan’s Spiritual Structure: The Story of the “Doorways to Demonic Possession” and "Satan's Spiritual Structure"
The page from "A Demon-Hunting Veep"
I previously wrote about how the decontextualized panel from the Chick tract parody I created to promote the film Ivy League Exorcist: TheBobby Jindal Story became viral. Since then, there have been sporadic viral outbreaks on various websites (most recently by BonJob on Reddit). This is understandable because the image is floating out on cyberspace and, without the rest of the comic book, it has no identifying markers. 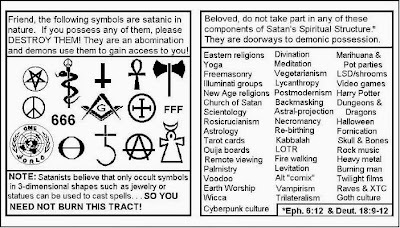 Also, the panel and the tract itself (“A Demon-Hunting Veep?”), although satirical, have verisimilitude; they contain information that reflects the fundamentalist worldview. In fact, for the Satan’s spiritual structure panel, I used various fundamentalist sources—namely books published by Chick Publications. The idea of this supposed structure comes from the Chick Publications comic book Angel of Light. The majority of the individual components listed are from fundamentalist literature, mostly from Chick Publications (books by Jack Chick and former Chick Publications luminary Dr. Rebecca Brown who railed against yoga and vegetarianism in the book He Came to Set the Captives Free). While my list is satirical, it is true in the sense that some religionists take these things very seriously. 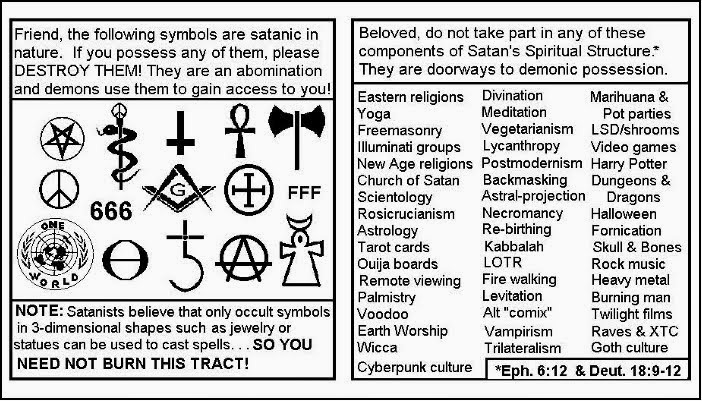 Notes: On the page adjacent to Satan’s spiritual structure, there is a pictorial list of supposed satanic symbols (along with a note, paraphrased from the Chick Publications comic book Spellbound that because the images aren’t three-dimensional, it’s not necessary to burn the tract). Most of the symbols are from Chick Publications comic books though I got some of the symbols from the book The Edge of Evil by Jerry Johnston, a protégé of Jerry Falwell (who like his mentor likes the good life). . . Many of the Chick Publications comic books cited (such as Spellbound) are based on the writings of alleged former Druid priest John Todd (1949-2007) who claims were debunked (ironically, one of the books debunking Todd’s claims, The Todd Phenomenon (1979), has its introduction written by Mike Warnke, another phony former Satanist whose claims were debunked in the early 1990’s. . . The recent book The United States of Paranoia: A Conspiracy Theory by Jesse Walker assesses Todd’s claims extensively. It also notes that in the early 1980’s, Randy and Vicki Weaver, of Ruby Ridge notoriety, sponsored at least one of Todd’s speaking appearances. . . At the recent MIX Comics Symposium at the Columbus College of Art and Design (CCAD), I met the guys from 2 Headed Monster Comics who have the superbly done and amusing Halloween-themed Chick tract parody “It’s Candy Time!”. . . Also read the revised Chick tract parody I created "Ivy League Exorcist." How can one parody or satirize Chick? He's already done it all.